Today, when many nationalist media organisations and people celebrate the birthday of Narada, the world’s first journalist, the inventor of Veena and the mediator par excellence, the so-called progressive and secular intellectuals project it as an attempt by the Sangh Parivar to saffronise the media. But the growing popularity of the event across the country reflects the increasing realisation about the relevance of the philosophy of the Divine Sage in the contemporary media scenario. With Marxist historians dismissing virtually the entire Hindu cultural history as mythology, it was but natural that from films to television serials, Narada, one of the ‘Saptarishis’ and ‘Prajapatis’, the Chief of the Gandharvas or the divine musicians, was always projected as a comic character who indulged in gossip and created differences between the Devas and Asuras. But what was lost sight of, of course deliberately, were the principles of communication this universe trotter enunciated as he traversed the heavens, the earth and the netherworld, in the pursuit of truth. To begin with, while Narada’s narrative might have led to clashes between the good and the evil forces, his ultimate objective was ‘Vishwa Kalyan’ (welfare of the world) and if a conflict was required to achieve that, so be it. He was not a gossip monger but a conveyer of facts. There are several instances where he has praised demon kings much to the discomfort of the Gods including Lord Indra. When mankind, including sages, was harassed by the evil forces, he would dutifully draw the attention of the divine beings including the Holy Triumvirate (Brahma, Vishnu and Shiva) to remedy the situation forthwith and provide relief to the masses. Speed, accuracy and objectivity, the cardinal principles of journalism were articles of faith for him. Simple to the core, he traversed the three worlds tirelessly without any ostentation. He was the ultimate field reporter relying more on seeing events personally before reporting them as against the current trend of desktop journalism. A gossip monger would always act opportunistically to obtain information shifting his loyalties at the drop of a hat. But Narada never hid his loyalties to the Lord, relentlessly chanting his name, yet he won the confidence of even the enemies of the gods, who revealed to him their innermost secrets. He had the courage to tell the demons on their face about their wrong doings without earning their wrath. He never hesitated from forewarning the evil forces about their fate if they don’t mend their ways yet no powerful man or demon could influence him to compromise on his integrity. He pleaded for a fair trial and justice to even the most wicked and cruel yet never conducted a Kangaroo court (as we see now-a-days on prime time television) and punished the culprits. He never arrogated to himself the role of a judge. The Sage never pre-judged people but came to conclusions only after personal experience. There were no untouchables for him. He was accessible to everyone and had contacts cutting across the universal spectrum. It was for the Gods to punish. His task was only to inform and educate and where necessary, mediate; to juxtapose truth and falsehood, for the larger good of the universe (Lok Kalyan). Narada was also an erudite scholar not a shallow, superficial journalist who carried tales. In fact, among the 18 Puranas, Narada Purana is perhaps the most significant as it was created by none other than the divine sage himself. It is said, “Naradoktam Puraanam Tu Naardiyam Prachachhate” (Narad Purana is what emerged from the lips of Maharshi Narad). Initially it had a collection of about twenty-five thousand stanzas. But, the currently available version of Narad Purana contains not more than twenty-two thousand stanzas. The Narad Purana has been divided into two parts. The first part contains four chapters including a dialogue between Suta and Shaunak, origin of the universe, salvation, birth of Shukadev, training of the mantras, worship rituals, provisions and the results of the various fasts observed on particular days in particular months while the second part encompasses beautiful stories related to various incarnations of Lord Vishnu, depiction and significance of pilgrimage centres and performing pilgrimage. Sage Narada stands out as a beacon light to the media fraternity as it passes through a turbulent phase marked by sharp decline in values and ethics, commercialisation and commodification, sensationalism, pessimism, materialism, corruption, immaturity, irresponsibility, immorality, arrogance, ideological fanaticism, lack of scholastics, courage, conviction, mission and vision. As regulatory bodies and media organisations including trade unions and universities struggle to evolve a widely acceptable code of conduct or ethics for the profession, there cannot be more worthy example to emulate than the persona of the ‘Adi Patrakar’ or the father of journalism, as explained elaborately by none other than Lord Krishna Himself. Responding to a question from King Ugrasena on why he was so fond of Narada, thus spake Lord Krishna, “I bow down to that Narada who has been born from the lap of Brahma, who has no arrogance due to learning or good conduct, but whose learning and good conduct are well known. I bow down to that Narada who has none of these defects—absence of interest, anger, fickleness and fear. He is composed and free from (habitual) procrastination. 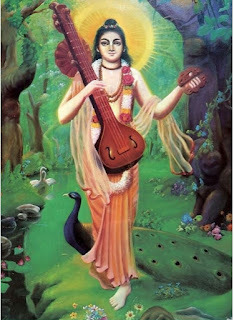 I pay obeisance to that Narada who does not change his word (once uttered) either due to lust or to covetousness and who is conversant with the principles and goal of spiritual endeavour, who is forbearing, powerful and straightforward, who has conquered his sense organs and who speaks the truth. “I bow down to that Narada who is full-grown and venerable in respect of splendour, fame, intellect, prudence, humility, birth, and penance, whose conduct and dress are pleasing and whose diet, behaviour, eyes and utterances are good, who is tirelessly engaged in altruism, who has no sin, who is enthusiastically engaged in bringing good to others, who always abides by the duties enjoined in the Vedas, Smritis and Puranas and who is free from either pleasure or displeasure, who is uninterested in food stuffs and other things, who is learned, who is never idle, who is a Brahmana of vast learning and whose narratives are charming, who has never erred before in respect of wealth, anger, and love, and by whom these defects have been eliminated, who is devoid of the defect of infatuation and fascination, who has unwavering devotion to God and Bhagawat Dharma, whose moral policies are supreme and who is of a reserved disposition, who is never contaminated by contacts, who is eloquent and who has no prolonged doubts, who never finds fault with any scriptural text, whose life is a personification of penance, who never spends his time without recollecting God and who always keeps his mind under control.